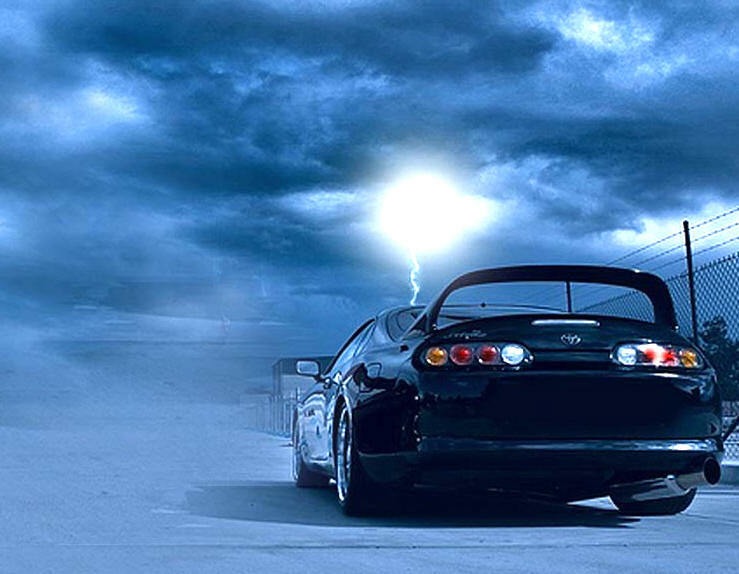 Now i have done a new supra wallpaper photoshop design in several different screen resolutions. If you like toyota supras, go ahead and download my photoshop wallpaper of my own supra MK3 car and a suprafriends blue car too. Only one version of this mid-range, 2+2 sportscar was officially available in Britain - the 3.0-litre twin-turbo. It produced 326bhp, had rear wheel drive and commonly came as a four-speed automatic, although six-speed manual was available. Top speed was an impressive 160mph. Proper sports styling, and over-large and unsubtle rear spoiler meant it there was plenty of show to complement the go. But the humble Japanese badge was a problem and despite combining performance and looks, the Supra was never given its due as the proper performance car it certainly is, which is why it was dropped from the UK line-up after only three years. Looking after your Supra is no easy task, especially as the years can erode your investment in your pride and joy. What is totally recommended is to choose quality car care products from a reputable online supplier such as Waxit.com.au or if you are looking for car detailing products for your Supra, Detail Central is a natural good choice as well. Both of these distributors of quality car care products and detailing supplies have online stores for convenient purchase and delivery. The firm, harsh ride and limited luggage space make the Supra a specialised used buy, especially as many grey used imports have come to the UK. But British spec was luxurious, with leather trim and plenty of equipment, and you’ll pay very little for them. You can tell UK Supra-versions apart from the plethora of grey imports by the additional central bonnet vent and headlight washers. Parts are much cheaper than almost any other sports cars you could think of. The Supra is a performance bargain, unfairly cast aside as a ‘wannabe’. Besides the 280-326bhp Japanese market RZ version there’s also a lower powered SZ version with 225bhp, which usually does without the rear spoiler. This amount of different equipment combinations might be irritating. Furthermore almost all options (leather seats, airbags, targa roof, rearspoiler etc.) available could be ordered as extra equipment for all other versions. The targa roof is an option that could be only ordered together with the automatic gearbox. It wasn’t available with turbocharged versions from 08.94 on. Big brakes were available from 05.95 on (standard on RZ, all others: option) The biggest differences between J-Spec vehicles and export vehicles can be found under the hood. The 2JZ-GTE turbo-engine specified for the Japanese Domestic Market does use smaller injectors (440ccm instead of 550ccm), a different intake camgear and turbochargers with ceramic exhaust turbines (type: Hitachi CT20) instead of metal turbines. This leads to a lower maximum power output J-Spec Supras reach. Official figures aren’t available since Japanese manufacturers had a “Gentlemen Agreement” about advertising cars destined for their domestic market with a maximum of 280hp. They say that go faster stripes don't actually make your car go faster. "What you say, you're kidding me?". Nope it is dead set a home truth you need to remember. But if on the other hand you do fancy some go faster stripes or branded graphics, let's just say you are lucky enough to pick up a sponsor or two and the race track is where you spend a lot of time, then going for a full car wrap is something to consider. Guys like Matt and Grant Wiles (twins - identical) are a couple of sign writers who specialise in vehicle signage and full vehicle wraps. Sure beats the old school way of having to hand paint signage or advertising, which is how it used to be done before the ability to use computer graphics came along. For choosing a car paint nowadays there are fakes or not effective, but there are car paint protection reviews which you can find in the internet and make your judgement out of it. Anyway go faster or just push your sponors to 155mph, either way a professional applicator is who you should be using. Absolute Sign Solutions is where you can find the boys, in Brookvale. Nevertheless J-Spec Supras are measured with (~310-320hp DIN/~300-310hp SAE) on the dynometer. J-Spec Supras do have a limited-top speed at JDM-typical 180kph (112mph) while export models are limited to 250kph (155mph). In the US both engine-versions were available (only Turbo in Canada) as well as both roof-versions, what made a high number of combinations possible. Turbo-equipped vehicles were the top-of-the-line models in the model range. They came with the big version of the brakes (with 17″-rims) and leather seats as standard-equipment. A speciality are the rare “Hardtops” - Turbo-vehicles with a hardtop instead of a Targa roof. They were marketed as the “sportiest version” and are around 100kg lighter then Targa-Models. For weight-reasons they are equipped with cloth-seats from the Non-Turbo version as standard, nevertheless leather seats were available on demand. 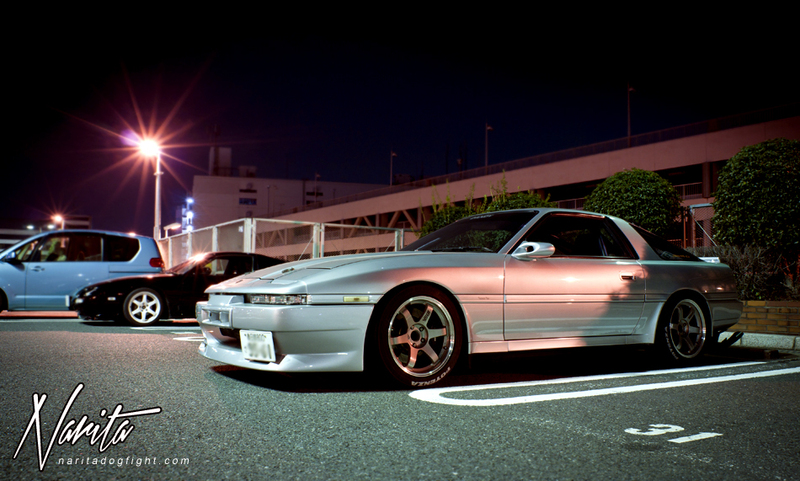 To boost up sales Toyota US introduced the “Supra SE” in 1995. Though being the “Special Edition” it is more likely a “low-budget” version: Non-Turbo with mechanical driver’s seat adjustment, cloth-seats as standard, small brakes with 16″-rims and hardtop. North-Amercian specified Supras can be identified by their side-marker lights (Picture shows facelifted version), which are a substitute for the indicators on the front-fenders. MY ‘96 Supras weren’t available as 6-Speed manuals due to emission restrictions. Both engine types got equipped with OBDII-Interfaces, turbocharged vehicles already got the facelift-type traction control with “Snow”-Mode. Features like the active front spoiler, the hood-scoop and glass headlights were not available in North-America. The Canadian version shares the same specification with the US version minus some differences in equipment. Sales ceased in 1998 (Canada: 1997) due new emission restrictions and decreasing sales. The EU-Spec has been developed basically with having the high average speeds on European roads in mind. EU-Specs do have a special hood-scoop (Picture) made from glass-fibre plastic to cool down cylindres #5 and #6 and a rear-differential cooler. Automatic EU-Specs do have an additional gearbox oil cooler in the right hand front bumper vent. The rear-light layout is different from Japanese and North-American models as a rear fog-light is compulsory in most European countries. On the left-hand side it’s: Turn signal, brake-light, reverse light, rear fog-light. In Non-European Supra models the last two are interchanged and instead of the rear fog-light a second brake-light is placed in the case. EU-Spec headlights are glass-covered instead of plastic and particularly German and UK-Specified vehicles do have a manual beam-level control (compulsory in these countries). Another feature EU-Spec vehicles do have is an active front-spoiler (Picture) deploying at speeds over 90kph (54mph) improving front down force. It hides behind the front spoiler lip at speeds under 70kph (42mph) . This spoiler is part of the standard-equipment on all European vehicles except German vehicles (additonal equipment without extra charge together with the high rear spoiler (Picture) as the “Aerodynamic Package”) and Swiss vehicles, which aren’t equipped with this “Aerodynamic Package” due to national legislation forbidding the high rear spoiler. Swiss MKIV are equipped with the wiring loom for the Spoiler-ECU though. Outside Europe the active front-spoiler was only available in Japan (additional equipment). Another speciality is the small rear spoiler (Picture), that was only available in Germany through official Toyota Accessory (TTE). Conservative German customers disliked the look of the high rear-spoiler what lead Toyota Germany to ask automotive supplier B+M to develop a smaller version of the high spoiler. Equipment details vary from country to country. EU-Spec Supra models are usually equipped with the Targa roof. Hardtop models have been only available in Switzerland (on demand, either with 6-Speed manual transmission or 4-Speed Automatic Transmission) and the United Kingdom (standard equipement, Targa roof not available). Furthermore UK-Spec models do have head-light washer jets (Picture) due to the bad weather. Sales in Europe have been ceased in early 1996. In the end of 1996 the new emission regulation “Euro 2″ had become compulsory. Toyota found adapting the Supra to these standards for not profitable enough due to the small sales figures in Europe. The last examplars have been delivered to their customers in early 1996. The Turbo takes its time catching hold at low engine speeds; but when it does, the power surges into play dramatically. That can be annoying around town, actually - you get little power initially, but then an avalanche suddenly arrives as the twin turbos kick in. Handling is top-notch on all Supras, with little body lean through turns and tenacious grip from the low-profile tires. On normal roads - smooth and dry - you get a secure, planted feeling as the suspension soaks up bumps fairly well. On rough pavement, the Supra begins to lose its composure. Tires bang over every pavement flaw, transmitting every little ripple into the cockpit. Traction diminishes greatly on wet surfaces, too. The driver and passenger have ample head and leg room, but the back seat is basically for decoration. Cargo space also is limited, as the trunk is shallow and has a high liftover. Visibility is good to the front, fair to the sides, but poor to the rear, restricted by the narrow back window and tall tail. Gauges and controls are easy to see and reach, except for the radio, which is mounted too low. 1994 Toyota Supra: Except for a numerically higher final-drive ratio on the base Supra, nothing was new on Toyota’s rear-drive sports cars. 1995 Toyota Supra: Unchanged this year, Supras again came in base and Turbo form. 1996 Toyota Supra: For 1996, the 6-speed manual gearbox disappeared, because it failed to meet stricter emissions limits, so all Supra Turbos got automatic. 1997 Toyota Supra: All 1997 models were 15th Anniversary editions, and the 6-speed manual transmission returned. The Anniversary package included a rear spoiler, premium cassette stereo, special floor mats, and limited-edition exterior badging. New solar-energy absorbing glass replaced the prior tinted glass, and the Supra’s flush headlamps and taillamps got a graphite background. Sadly, Supra got the axe for ‘98. 1998 Toyota Supra: Leftover 1997 Supra models were sold for a short time in 1998. This awesome Toyota Supra MKIV is done in style of the TV-series and movie General Lee - Dodge Charger. Enjoy this amazing toyota supra MKIV! Its always nice to see toyota Supras driven hard. Enjoy this supra collection! Toyota Celica Supra Mk II (1982-1986) Toyota supra turbo - MKIV MKIII MKII suprazone In the US, the engine was changed from the SOHC 2.8L 5M-E to the DOHC 2.8L 5M-GE. The MK2 came in 2 flavors: the P-type (Performance type) and the L-type (Luxury type). They were differentiated by the available options, tire/wheel combo, and body trim: the P-type had fiberglass fender flares over the wheel wells, while the L-type had simple smaller flares molded into the metal above the wheel wells. Greddy wastegate and turbo, intercooler apexi meters racingparts way to trd supraparts Upgraded compressor wheels, Garrett turbo Turbine. Toyota 2JZGTE engine. Carbon hood. HKS and TEIN performance parts. KONI Sport Struts Front Kit 1987-1992 Supra. Typically the P-type came with either 4.10:1 or 4.30:1 rear gearing, while the L-type came with 3.727:1 rear gearing. Around the world, the Mk 2 came with a variety of other engines. Some models sent to countries (like Sweden, Switzerland and Australia) retained the Mk 1's 5M-E (In Australia, the only petrol available at that time was leaded), while in Japan the MK2 (MA-63) offered the option of the turbocharged SOHC M-TE engine or the 2 litre twin turbo 1G-GTE (GA61). Greddy wastegate and turbo, intercooler apexi meters racingparts way to trd supraparts Upgraded compressor wheels, Garrett turbo Turbine. Toyota 2JZGTE engine. Carbon hood. HKS and TEIN performance parts. KONI Sport Struts Front Kit 1987-1992 Supra. In the middle of 1986, Toyota was ready to release its next version of the Supra. The bonds between the Celica and the Supra were cut; now they were two completely different kind of models. The Celica changed to front wheel drive (FWD), while the Supra kept its rear wheel drive (RWD). Though the A60 (Mk II) and A70 (MK III) had similar designs, the engine was a more powerful version than the earlier 2.8L and 3.0L engine with two versions*: one with a CT-26 turbo (the 7M-GTE) and one without (the 7M-GE). The non-turbo 7M-GE models came standard with the W58 manual transmission, and the 7M-GTE came standard with the R154. In 1988 the Turbo-A model was introduced, it was a special design aimed at winning the Group-A touring car championships around the world. There were only 500 Turbo-As ever made. The Turbo-A was a special 7M-GTEU with 267PS (263hp/196kW), making it the fastest Japanese road car until the Nissan Skyline R32-GTR was introduced. The Turbo-A model was only produced in black, all featured leather interiors, a front intercooler inlet, were hardtops and only used MAP engine sensors. Other enhancements include higher boost (7.8psi), long lift cams, larger injectors, larger intercooler and a high flowed version of the CT26 turbocharger. The A70 Supra was also available in two non export models in Japan, the JZA70 with a 2.5L 280hp (209kW) twin-turbo 1JZ-GTE, known as 2.5GT Twin Turbo R (JZA70), and with a 2.0L 210hp (157kW) twin-turbo 1G-GTE. Greddy wastegate and turbo, intercooler apexi meters racingparts way to trd supraparts Upgraded compressor wheels, Garrett turbo Turbine. Toyota 2JZGTE engine. Carbon hood. HKS and TEIN performance parts. KONI Sport Struts Front Kit 1987-1992 Supra. With the fourth generation of the Supra, Toyota took a big leap in the direction of a more super sports car. The new Supra was redesigned from the ground up and featured two completely new engines: naturally aspirated 2JZ-GE 220hp (164 kW) and 210lb-ft (285 N·m) of torque, or a twin turbocharged 2JZ-GTE making a whopping 320hp (239 kW), 315 lb-ft (427 N·m) of torque. The turbocharged variant could achieve 0–60 in 4.6 seconds and 1/4 mile (402 m) in just under 13.1 seconds at over 109 mph (175 km/h). The stock turbos are capable of running around 400bhp (298 kW) with an unrestricted airflow/exhaust system and an aftermarket boost controller (commonly known as a BPU setup). The MKIV Supra's twin turbos actually operated in sequential mode instead of parallel mode as the "twin turbo" name usually implies.